Windows 10 is forcing people to update almost every few days and a lot of users are facing problems with it. We are here with a simple solution stop updates on Windows 10. At the bottom select Advanced Options. There is a Text as Pause Updates. Toggle the Below Button to pause updates for up to 35 Days. When 35 days are over you will have to update your Windows to pause it again. It’s done, easy as that. Pause Updates for more than 35 Days. Note: This method is not a hack or illegal, this method is used to changes the value 35 days to desired number of days. Open Run Command or use WIN + R to open. You can either navigate or got to the following directory. Or copy above code and paste in the address bar of your Registry Editor. When you click on Settings in the above path, you’ll see a lot of options. You may or mayn’t see it. 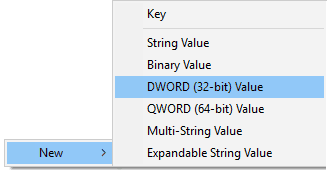 If you cannot find it just right click on the white space and select NEW > DWORD (32 bit) Value. In the value name put below words. Now Right click on the above Entry and Click Modify. In the Value Data Option Enter Number of Days for Pausing Updates. Now Follow Below to Pause Updates. Toggle the Below Button to pause updates for up to desired number of Days.